Hiking is one of the most interesting outdoor activities. Most enthusiastic hikers tend to look for new destinations each time they go hiking. As a result, taking photos and videos is paramount for these activities. Whether you are hiking in the mountains or traveling the world, taking photos using an ordinary camera may prove a little difficult, and you may end up missing some important shots. That is why people have looked for great travel drones. Drones capture excellent aerial videos and images, and they have a good field of view. You can capture captivating images to show to your friends and family, and remind yourself of the awesome hiking experience. This post will review the best drones for hiking that you could get yourself. 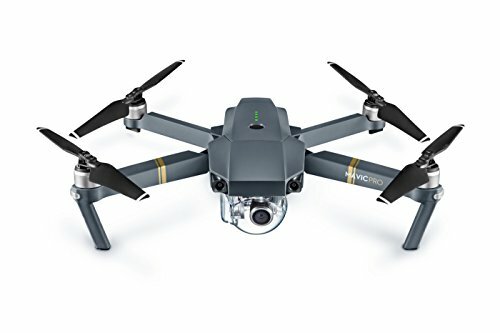 We will start our list with DJI Mavic Pro mini drone which is one of our top picks and a great aerial photography drone. One of the most impressive features on this drone is that it is portable, allowing you to go with it through your hiking and backpacking escapades without getting tired. This drone is controlled using a remote control that is fitted with OcuSync transmission technology that allows you to fly it to a range of 4.3 miles/7kms. You can also use wifi signals from your phone to control the Mavic if you choose. Interestingly, you can use this device to stream short-range videos at 1080p hd and long-range videos at 720p. Impressive, isn’t it? What’s more, the drone supports 4K video quality at 30 frames per second, and it includes a 3-axis gimbal that ensures the camera has great image stabilization at all times even under high speeds. This feature enhances precision and ensures you capture crisp and smooth images. The Mavic has great image quality in regard to both video and photo capabilities. Despite its small size, Mavic has an impressive flight time of about 27 minutes, which is more than enough time to allow you to capture all the quality images that you desire. If you intend to use the DJI Mavic Pro in areas with a lot of forest cover, you don’t have to worry about it crashing into a tree. It is fitted with Flight Autonomy Technology that enables it to sense obstacles up to 49 feet away. It can either go around the obstacle or come to a halt to avoid crashing. In addition, it has a return to home mode to improve its navigation. Needless to say this drone has great automated flight capabilities which are great for hiking in the great outdoors. It is also fitted with sensors that improve its control, and TapFly, a feature that enables the drone to fly smoothly in the direction you desire. Interestingly, you can take selfies with this drone by relying on its hand gesture mode. All you have to do is wave at it and snap, it takes a photo of you and your hiking buddies. These features make the Mavic a great selfie drone. • It records high-quality travel videos and captures superb images. • The drone is easy to fly. • It has obstacle avoidance and safety features. • The drone has excellent flight time. • It is portable, will easily fit in a drone backpack and has third party landing gear availability. • It flies at a great altitude. • It is hectic to fly in the evening. • It is mostly suitable for Apple devices. • The software is a bit disappointing. • The battery is not long lasting. It has to be replaced after a couple of months. It is ideal for a beginner looking to get a not so expensive drone. Its altitude capabilities also makes it ideal for those who like hiking in hilly regions. It is also great for those who may run a travel blog or looking for a drone for backpacking. There is a new version called the DJI Mavic Pro Platinum, which has a battery life of 30 minutes and lower decibel level than the original Mavic Pro. Autel has once again outdone itself by manufacturing one of the best drones for hiking, the EVO. The EVO is one of the newest drones on the market. Some of the things that make this an ideal device for hiking is its ergonomic and stylish design. 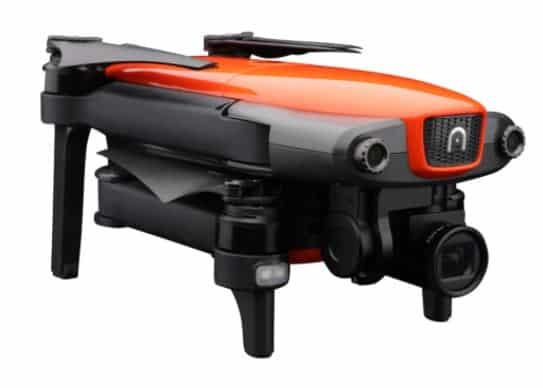 The orange color enables you to view the drone even when you are flying it in foggy weather. The drone also has a strong construction, and Autel has ensured to fit it with intelligent flight technology to allow seamless flying. It also allows you to capture quality images and videos with its 4K UHD camera that operates at 60 frames per second. In addition, it is fitted with a 3-axis gimbal stabilization that enhances its image stability, allowing it to capture clear images throughout your hike regardless of the speed. Other interesting features on the drone include its front and rear sensors that enable it avoid obstacles in its path, which prevents crashing. What’s more, you can fold the EVO to enhance its portability. With a range of 7kms, you can rely on it to take all the images you want and its remote controller has a 3.3” OLED screen that streams live HD dual band. Another commendable detail is that Autel offers reliable customer support in case you encounter any issue. 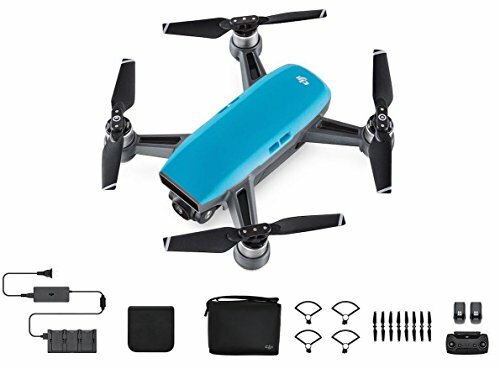 This drone also has an excellent camera with a 94◦ FOV, and it supports file formats such as DNG or JPG for images and MP4 or MOV for videos. What’s more, it is compatible with iOS and Android devices. • It has a wide field of view with follow me feature, called dynamic tracking. • Versatility – it supports Android and iOS devices. • The drone has a strong construction look to it. 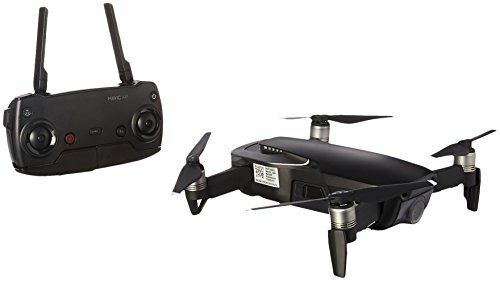 • Great 4k camera drone as it comes with customizable settings to suit your preferences. • Customer support is available any day of the week. • It has several flight modes and avoidance systems. • Its batteries take a long time to charge. It is ideal for experienced and beginner hikers, travel bloggers and travel photographers, that want an affordable drone with a high-quality camera that will blow your mind. Undoubtedly, the Mavic Air is a device that matches price with quality and is one the best drones for traveling in its price range. It is built with Flight Autonomy Technology, a feature that enables it to sense obstacles up to 49 feet away to avoid crashing into them. Interestingly, it also includes OcuSync technology in its remote control, which enhances its range. It gives you a transmission distance of up to 7kms. With a flight time of about 27 minutes, this drone achieves top speeds of 43mph. Moreover, it captures smooth and crisp images because it supports 4K videos at 30 frames per second. The high-quality images are further enhanced by its 3-axis gimbal, which keeps the camera steady as you fly the drone. Portability is not an issue with this drone since it features a compact and lightweight design. Its navigation capabilities are enhanced by its GPS and Vision Position-Based Navigation. These features let you know the exact location of the drone at all times. The tripod mode on this drone ensures more precise flying by allowing you to fly it slowly, while its satellite positioning eliminates any drifting. What’s more, it has TapFly, which enables it to fly smoothly in any direction that you would want it to go. • The drone is easy to operate and fun drone to fly. • Its camera captures high-quality pictures and videos. • It comes fitted with sensors to avoid obstacles. • It has a compact and lightweight design for enhanced portability. • It can only be flown using its remote controller. It is ideal for hikers who are new at using drones and those that hike for long distances because of its portability. If you are an enthusiastic hiker looking to get yourself an affordable and compact drone, you might want to consider the DJI Spark, Fly More Combo. This is because the device will allow you to take quality images throughout the trip. It comes with a FaceAware feature that enables it to launch from your palm by just recognizing your face immediately you turn it on. Interestingly, you do not have to rely on a remote control to use this device; a simple gesture with your hand is enough to capture the images you want. What’s more, DJI Spark includes intuitive controls and intelligent flight modes that enable you to capture high quality videos by tapping. It also supports the DJI GO app that lets you share the images you have captured while hiking with your social media contacts. Moreover, it has an ActiveTrack feature that helps you to track objects depending on the speed they are moving with for more precise capturing. The drone also has a 2-axis gimbal that helps to stabilize the camera. It also has a 1/2.3-inch CMOS sensor that captures images at 12 MP and videos at hd 1080p. With an advanced flight control system, you can fly the drone at speeds of 31mph even in strong draught. Interestingly, it has HD Wi-Fi technology that allows real-time video transmission of 720p up to 2kms. The Spark is cable of up to 16 minutes of flight. • It comes in a compact, lightweight and easy to carry. • Its price is reasonable given its capabilities and flying time. • The drone comes in a sturdy construction. • It supports HD Wi-Fi video streaming. • It is easy to control. • It is controllable by gestures. • The drone has a short flight time. • It has a short flight range. • The manufacturer does not provide any customer support. It is ideal for beginners looking to enhance their hiking experience using an affordable hiking drone. It is a suitable product for beginners who are looking to spend less on a drone for hiking. The next item on our list is the Yuneec Breeze Flying Camera. Yuneec Breeze is an excellent drone for hiking because it comes fitted with all the features you need to embark on your hiking escapades. It comes fitted with a camera that allows you to capture 4K ultra HD videos and images at 13 MP. This drone is best suited for hikers who have never used a drone before because it is exceptionally easy to use. Interestingly, it comes with 5 automated flight modes: orbit, pilot, follow me, journey, and selfie for the ultimate video and image capturing experience. Another cool feature on this drone is its inbuilt indoor positioning system that makes it safe to fly both in indoor and outdoor environments. Its safety is further enhanced by the propeller protectors that ensure its propellers don’t come into contact with other items. If you love sharing photos with your friends on social media, you could consider this drone also supports an application, which you install in your phone to control and navigate it. Its durability is also something you have to worry less about because it comes with a 1-year manufacturer’s warranty. • The drone comes with safety features. • It is available at a reasonable price. • The drone is stable, allowing it takes high-quality images. • It is easily loses Wi-Fi connection. • It does not have a controller, making it harder to control. The drone suits newbie hikers that want an affordable drone, and those that hike in less windy areas. It goes without saying that when looking at the top hiking or travel drones that portability is a key factor. You want a compact drone that is light and that is easy to carry. You will thank us when your midway through a hike with your light weight drone. If you and your friends intend to go hiking anytime soon, you might consider accessorizing with the Holy Stone HS160 Shadow. The drone is portable thanks to its foldable and flexible blades that help to reduce its size, ideal for a backpack. However, this does not mean that you should underestimate its flight capabilities. 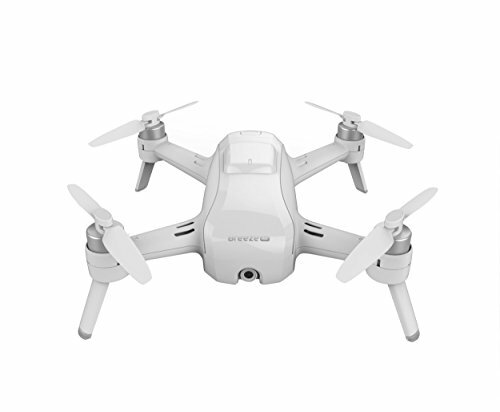 The device is fitted with a Wi-Fi FPV 720 HD camera that allows you to take crisp images and videos. The media files you take can be stored either in the mobile album system or the app. 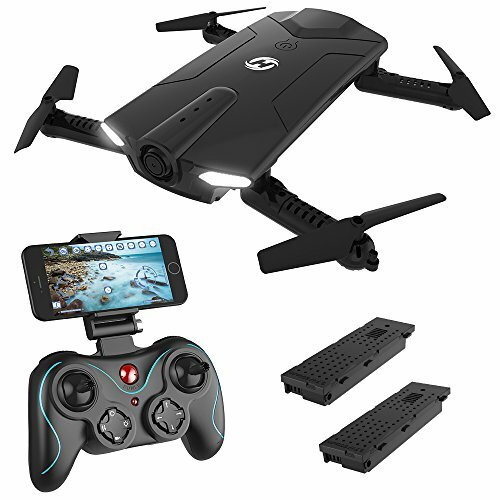 This drone supports both Android and iOS devices and is compatible with an app that helps you control the drone to get an ideal shooting experience in real time. This drone is further accessorized with 2 modular batteries and an extra one in case you are going for a long hike. One of its most interesting features is the one-key start and landing that enables any hiker to control it seamlessly. Moreover, it has a gravity sensor mode that enables it to follow the direction you move your smartphone. • It is easy to fly. • It includes LED lights that enhance its visibility. • The drone great for backpacking as it is portable. • It comes in a stylish design. • It includes a bonus battery. • It has a foldable design. • It is not ideal for use in windy areas. • It only about 6-8 minutes of flight time. • The app is a bit complicated to use. Choosing the best drone for hiking may prove to be a daunting task because of the many brands in the market. Each drone is built differently, and you would not want to get yourself one that does not meet your required standards. Below are some of the considerations you have to make to ensure you get yourself the best drone for hiking. When you are in the market looking for a drone, it is imperative to settle for one that has obstacle avoidance. This is an important feature, especially for those hiking in mountainous or forested areas. Obstacle avoidance helps you to control your drone better. It enables your drone to stop when it encounters an obstacle along its path or enables it to maneuver around the obstacle. This eliminates the risk of your drone crashing and getting damaged. Moreover, it allows you to concentrate more on taking quality images and videos rather than focusing on controlling the drone. A drone is usually powered by batteries, implying that it depends on the charge from the batteries to fly and capture images. This implies that it needs a lot of charge in order to fly effectively and capture all the images that you desire. Some drones have a better battery life than others, and high quality drones have a flight time of about 30 minutes before the charge runs out. As such, ensure to get a drone that has a long-lasting battery life for better operations. Carrying extra batteries in your hiking bag may also come in handy. Ultimately, the quality of the images and videos you take in your hiking or backpacking trip is greatly influenced by the camera fitted on your drone. We advise hikers to get a drone that is fitted with a camera that has excellent image and video resolution. Alternatively, you can buy a drone that allows you to fit your own camera. Whichever drone you choose, ensure to settle with a high-quality camera that can capture auspicious images and aerial videos. Keeping these facts in mind you can do some great travel photography with your drone. This is another important feature that helps to keep your drone’s camera stable even as you fly it in windy environments. This feature enables you take high-quality images and videos throughout your hiking escapades. Hiking often involves walking for long distances. The range of a drone determines how far it can go, and the bigger the range the better the drone. As such, buy a drone that has a bigger range in order to cover vast areas. When shopping for the best drone for hiking, it is advisable to get one that has an integrated GPS. The GPS feature on a drone allows you to know the exact location of the drone. A drone with a GPS also has a return-to-home feature. This improves the navigation capabilities of your drone, making your task a lot easier. Drones have come to revolutionize the way we take pictures and videos today. If you are an outdoor person, you will benefit a great deal by accessorizing with the best drone for hiking. Finding the right drone for your needs may not be as simple as it sounds. There are many products in the market, and you must get yourself a product whose quality matches its price. This is because the most expensive drone is not always the best drone. The features on the drone are the ones that count. We excluded drones like the DJI Phantoms, Gopro Karma drone, Ehang Ghost and Parrot Bebop drone due their size and bulkiness. We feel that for hiking, saving as much weight and space is ideal. To find a drone that will spice your backpacking hiking experience, review the drones listed above and buy the one that meets your hiking needs. Thanks to technology you can now travel the world with a portable drone and have great video and photos available at your fingertips. Bottom line, we hope this article has helped you to learn more about the best drones for traveling and select the top pick for your adventure travels. What about the ability to charge the batteries using Solar?!! I am hiking, I don’t want to carry more batteries than necessary. Not a bad idea, you can check out this article for some ideas on solar charging your drone while hiking.